Gnome Commander, an advanced twin-panel graphical file manager for the Linux OS, brings back memories of my pre-Windows days. That is an era when graphical shell programs were popular before the Microsoft DOS (Disk Operating System) desktop gave way to the Windows 95 GUI (Graphical User Interface). If that sounds like a put-down for Gnome Commander, I do not mean it that way. Linux has come a long way in recent years to equal or surpass the icon-driven desktop that Microsoft mimicked from Apple's desktop design. A two-panel file manager for any OS is sometimes a must-have tool. Nothing says fast and efficient like a good file manager app when it comes to working with files. Gnome Commander has the look and feel of these early file workhorse programs like Norton Commander and Midnight Commander. Not all file managers for Linux are created equal. As its name suggests, Gnome Commander is designed to run on Linux distros based on the Gnome desktop. Its powerful feature set puts Gnome Commander in an advanced user category among the likes of Krusader twin-panel file manager for KDE and the Thunar File Manager. Gnome Commander displays two file locations either vertically or horizontally. A choice in the view menu lets you switch between the two options. The full range of file management tools is available for all files in either panel. This puts everyday tasks such as renaming files, sending files, copy/delete/paste, open with and execute a right-click away. GC also provides just-as-quick access via a drop-down file menu to essential file tasks such as changing owner or group, changing permissions, editing properties and creating symbolic links. The view menu's checklist makes it easy to show/hide hidden files and show backup files, as well as displaying toolbar and buttonbar, device list and more. Gnome Commander is a life-saver when it comes to synchronizing files. I work with numerous desktop and laptop computers that often need non-networked access to each other's files. So I rely on thumb drives and external hard drives. GC lets me highlight the same file name or directories in two locations and compare the differences. I also can use the file manager's sync feature to move older or newer files between two locations or duplicate a directory. The Connections menu provides a quick hook-up to remote servers. Although this allows FTP file transfers, it is also a handy way to sync files with remote locations when necessary. If nothing else, this eliminates the need to run a separate FTP application. A few features built into Gnome Commander are not typically found in other Linux file managers. For example, you can extend the mouse context menu to call any external application to work on selected files or directories. This includes viewers, editors or custom scripts. GC does not have its own viewer modules. Instead, it taps into system apps. For instance, it opens a text file in the installed application such as gEdit or OpenOffice Writer. It opens a photo file with the Gnome Image Viewer. I particularly like the Quick Device access buttons. With most Linux distros, you have to manually mount external media like external drives, USB devices and cameras. GC does automatic mounting and unmounting. Like the FTP feature, auto mount is one more plus in the convenience factor that GC provides. Power users can easily drool over the feature set included in Gnome Commander. Some of the additional power user tools include the ability to view the latest accessed folder history and SAMBA access. Folder bookmarks are cool. It takes just one click to add any file or folder location to a list of bookmark list. It takes just one click to jump to any bookmarked location. The searching tools are fast. This makes is quick and simple to do file name searches in the current directory and symlinking. Something I wish were available in more apps I use is the ability to do advanced renaming of files. GC does this with support for various types of meta-data. Earlier versions of Gnome Commander lacked a built-in browser fro compressed files. That same weakness exists in the latest version 1.2.8.5, released on Feb. 14. This is a serious oversight for an otherwise excellent file manager. But there is a work-around. Download and install File Roller. 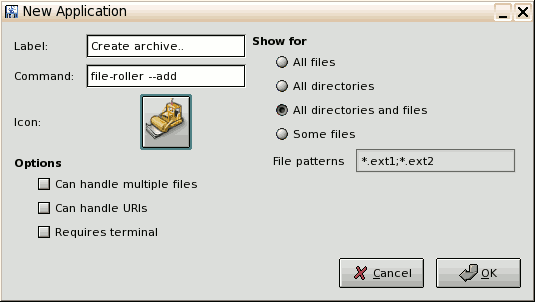 [*Correction - April 28, 2010] Then open the options dialog and go to the Programs tab. From there you can add setting to allow GC to handle archives. See the settings here and here. Once done, you can right click on any file or folder and choose Create archive. This is not a big deal. So I wonder why the GC developers have not yet gotten around to building this directly into the current release so users do not have to deal with tweaking. Keeping track of available storage space can be an annoyance in Linux. Gnome commander helps to remedy this situation. It shows the amount of free space for the storage devices displayed in the panel. So I can tell at a glance how much space remains on the hard drive and the USB drive, for example. The GC file manager also uses the function keys. This is something that Linux apps typically fail to do. Along the bottom of the app window is the function key list. Some of these functions work on the highlighted file name. Others execute for the active directory. For example, the F3 key calls up the file viewer for the highlighted file. The F7 key makes a directory. Other commands are: F4-Edit, F5-Copy, F6-Move, F8-Delete, F9-Search and F10-Quit. Gnome Commander is an above-par file manager that goes well beyond drag-and-drop functionality. It provides a hefty set of tools to manage files. Its dual-panel interface makes it much more powerful than dragging files between two locations using two running instances of a single-panel file manager, and its options list make configuration simple and effective. *ECT News Network editor's note -- April 28, 2010: The original published version of this story incorrectly referred to the program as "Filetroller." The correct name is "File Roller."